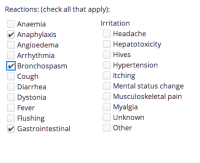 We seems to be including the wrong concepts for the allergen list and the allergic reaction list and displaying the wrong names as well! We need to display the allergens on screen differently than the concepts name - so while we store the concept ID - we also need to make sure we show the users a different label. Attached is a spreadsheet of the name we need to show on screen (the add/edit screen, the main allergy screen and the dashboard) as well as the concept that is mapped to that label. We should not be showing any other concepts than what is in the spreadsheet. Notice that morphines and codeines are mapped to the same conceptID- but we are still displaying both as different choices on the UI. 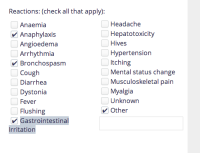 In the attached spreadsheet-all category of allergens and reactions also has "Other" option - these will be associated to "Other-Noncoded" concept but will be storing the free text the user puts in.